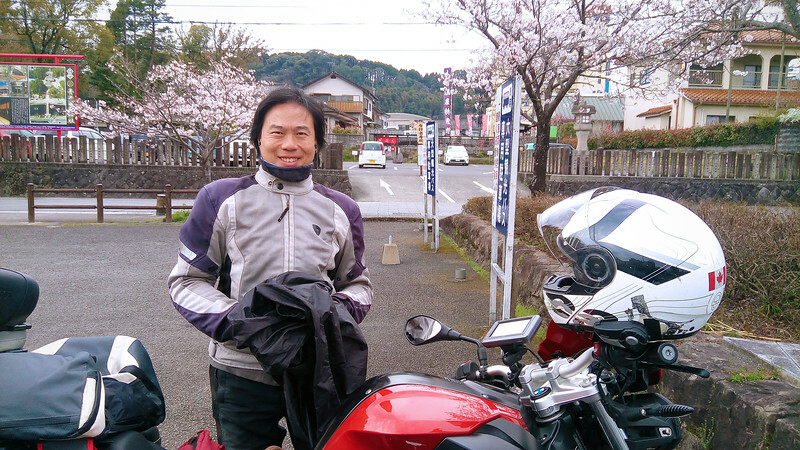 Apr 05 2017: Finally, Cherry Blossoms! 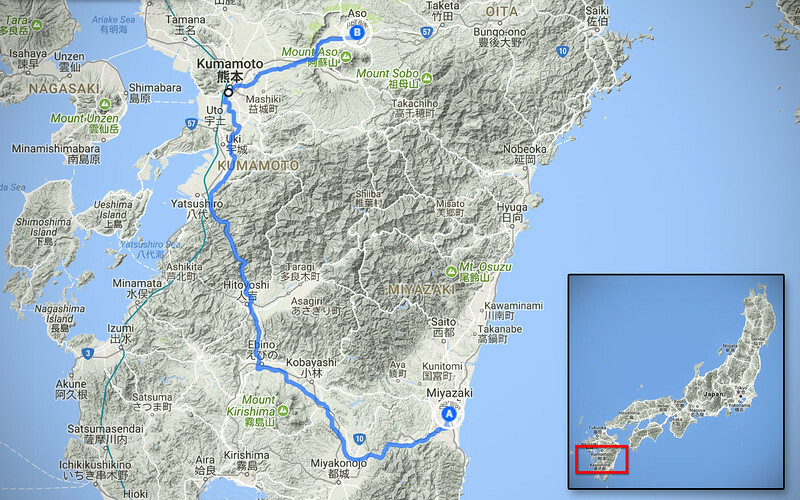 Miyazaki is the furthest south we'll venture in Japan. 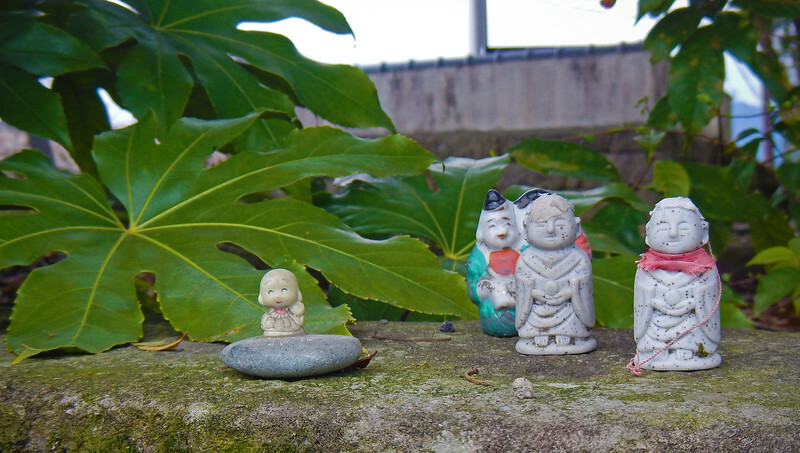 Today, we're heading to the north-west corner of the island of Kyushu. Suzuki doesn't have that large a presence in Canada, but there's a Suzuki shop and signs everywhere in Japan! 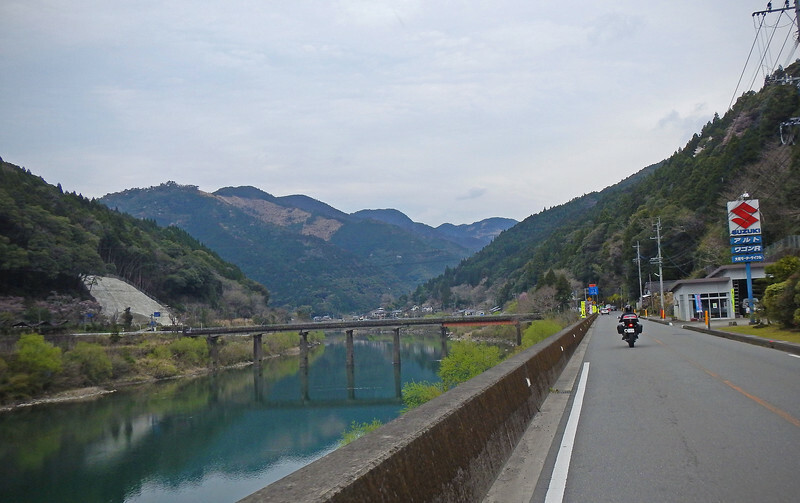 It's a pleasant, if not a bit chilly, morning's ride through the mountains of Kyushu. The road we're on offers us some scenic riverside views. 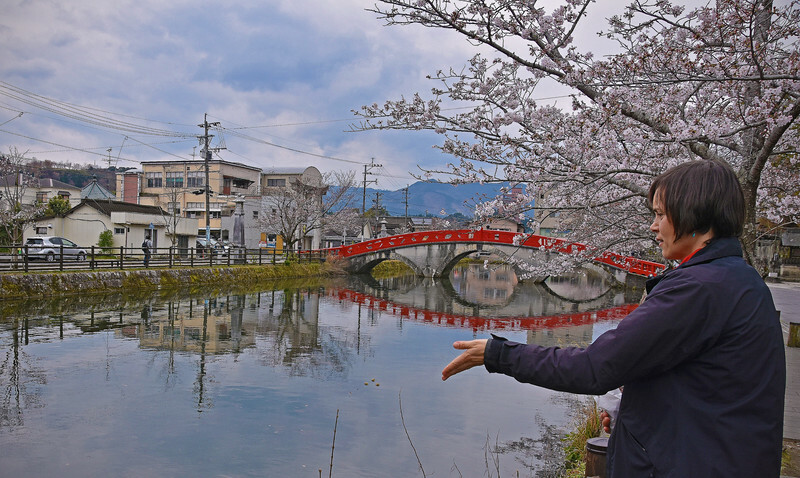 The town of Hitayoshi is about an hour west of Miyazaki. We stop to grab a quick brunch before doing some exploring. The guy who ran the place didn't speak any English, so we just pointed at the pictures on the menu: some chicken, some beef and some veggie dumplings. The plates come with 15 gyozas each and because we hadn't had breakfast yet, we scarfed them all down in a matter of minutes. They were delicious!!! Our gyoza guy came out to see how we were doing and he was very surprised we had finished them all so fast. He grunted out a very Japanese "Hoi? ", just like an anime character in all the shows that we've been watching lately, which made us LOL! 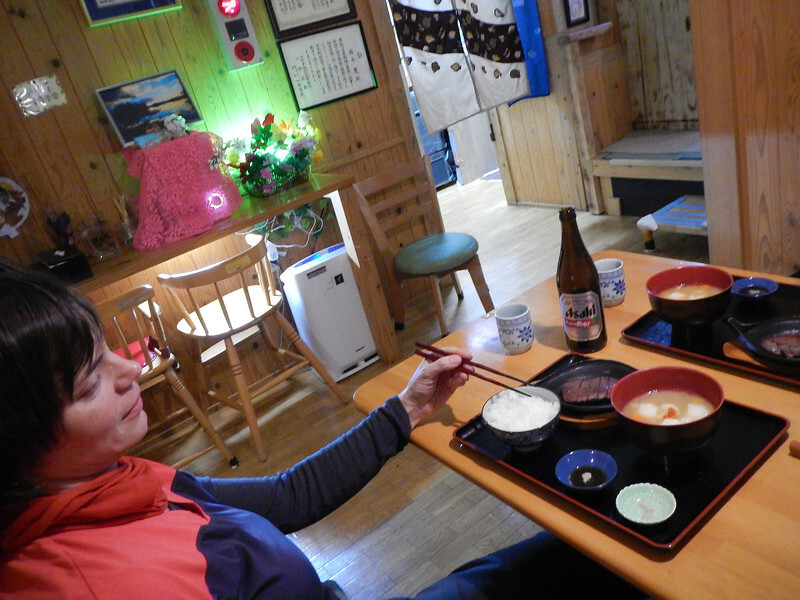 We ordered another plate of gyozas and took our time with the second helping of dumplings. Because the place wasn't that busy, our gyoza guy came to "talk" to us. 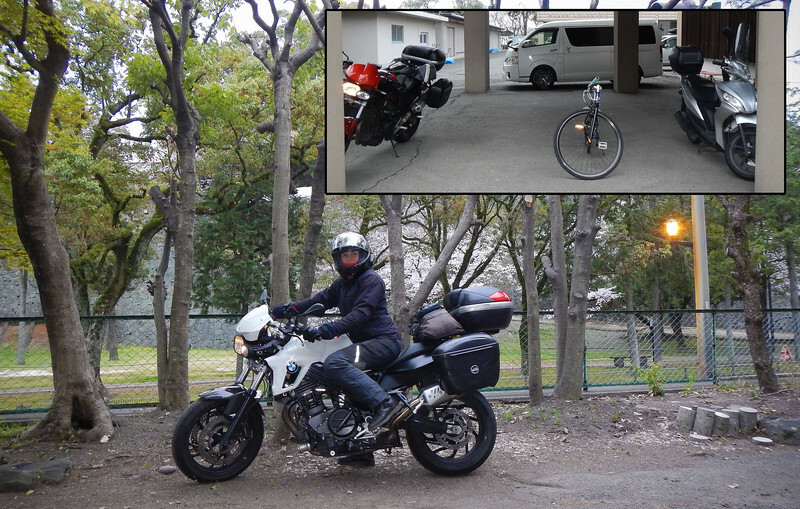 He had seen our bikes parked outside so he showed us pictures on his phone - he was a motorcycle rider as well, riding some kind of Japanese cruiser. Cool! The brotherhood of bikers transcends all language! 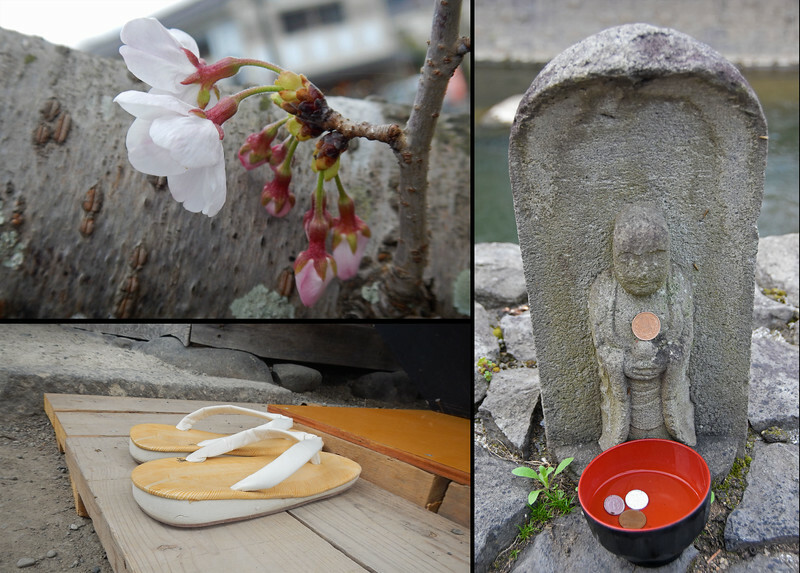 There's a shrine nearby we want to visit. 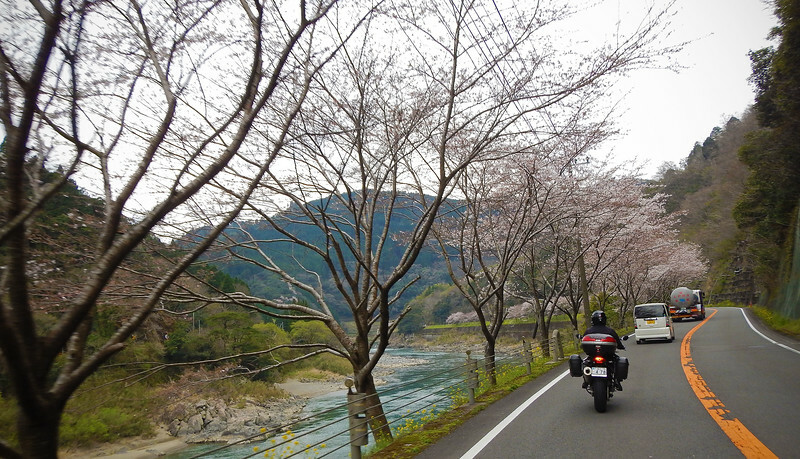 On our ride over, we see cherry blossoms! 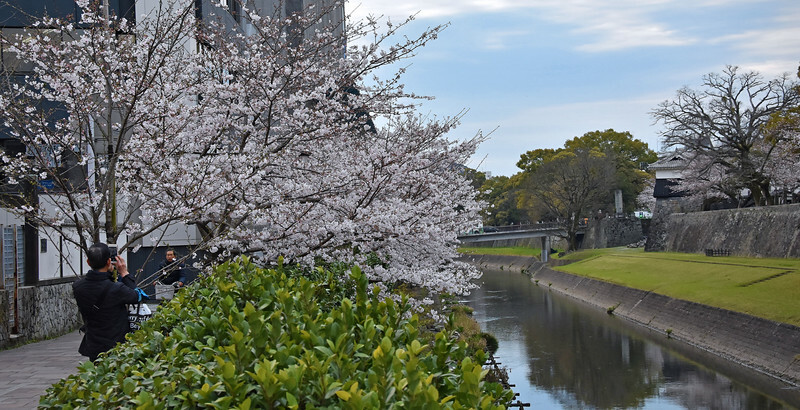 We've been enviously reading the news about the early cherry blossoms sprouting up in Tokyo due to the unusually warm weather they've been having. Now they've finally bloomed here in the south! So beautiful! Neda is very happy, this is what she's been waiting for all this time we've been in Japan! He's wearing the purple robes which signifies he's high-ranking. Lesser priests wear lighter blue. 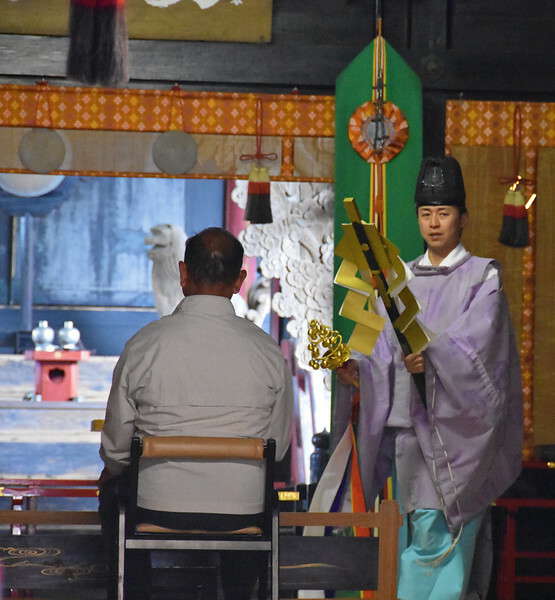 The black hat he's wearing is called a kanburi, which is part of the formal-wear worn by ancient nobility. This totally reminded me of the Hindu puja ceremony in India, where our Royal Enfield motorcycles were blessed against bad luck. 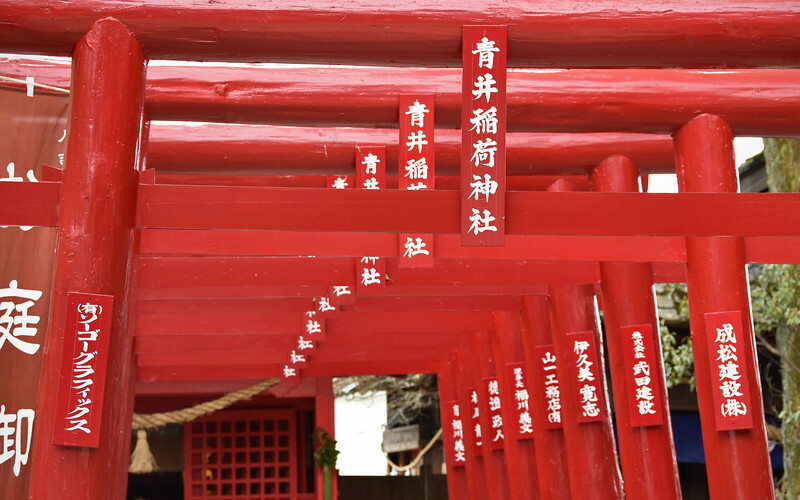 We already know walking through these red torii gates signify a transition to the sacred. The thinking here is that if one is good then a whole bunch in a row is even better! 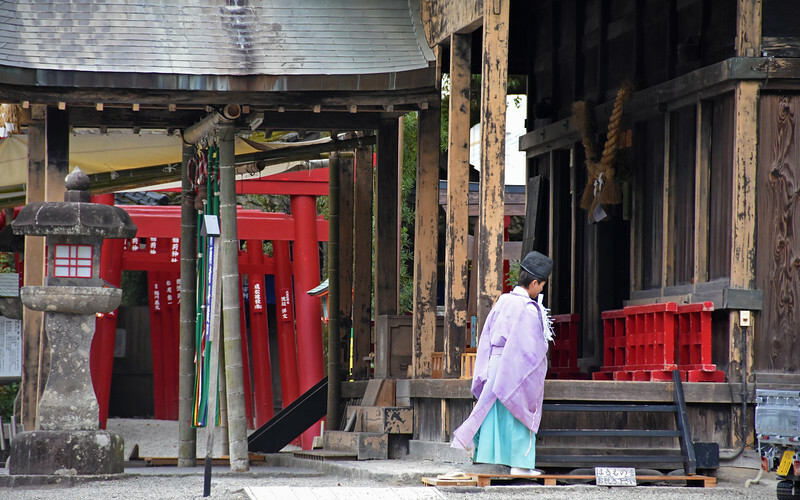 The Japanese seem to love multiplying artifacts, be they flags on the side of the paths and stairs, to torii gates! When it comes to good mojo, you can never have enough, it seems! With our bellies full of gyozas, we hop back on our bikes. From here, we are heading north up the western side of Kyushu island. 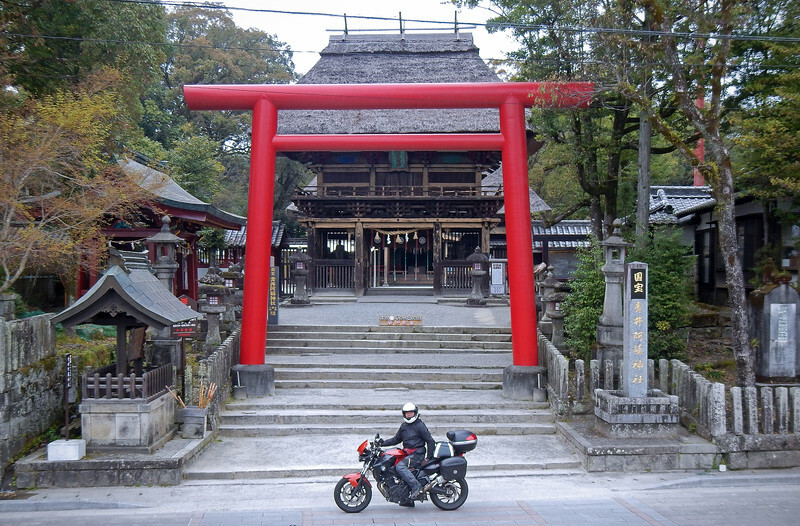 Another hour of riding and we enter the outskirts of Kumamoto, Kyushu's largest city. 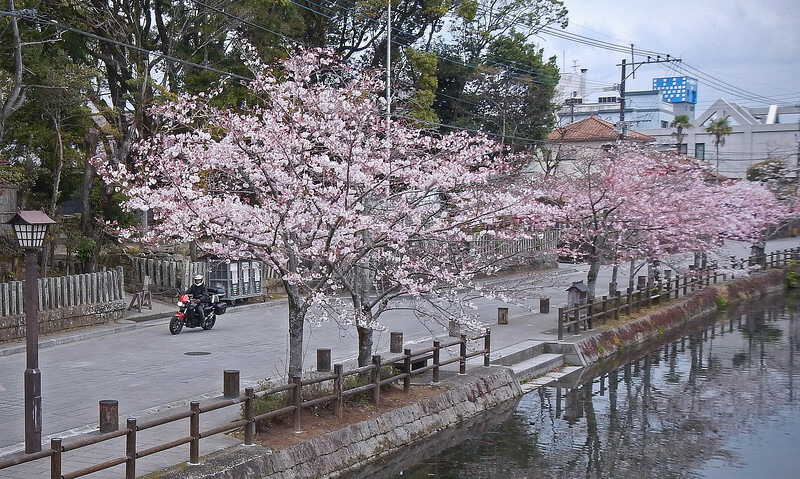 Cherry blossoms along the side of the road welcome us. I spotted a scooter and bicycle parked underneath a building, so I slid my motorcycle beside them. In the picture above, Neda says, "You're going to get towed for sure. I'm parking here, under these trees". Hah! I think *she's* going to get towed for sure parking over there. We'll just have to see when we get back... Game on! We're actually not here to see the city itself. 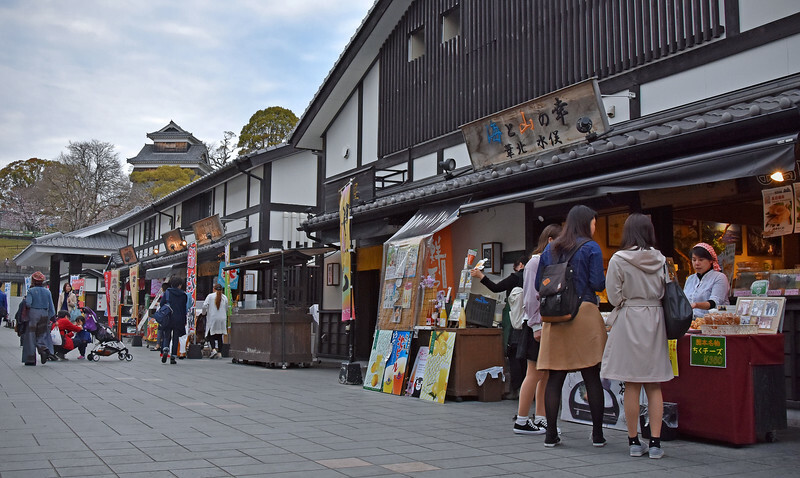 The Kumamoto Castle is right downtown, so we're making our way over there. 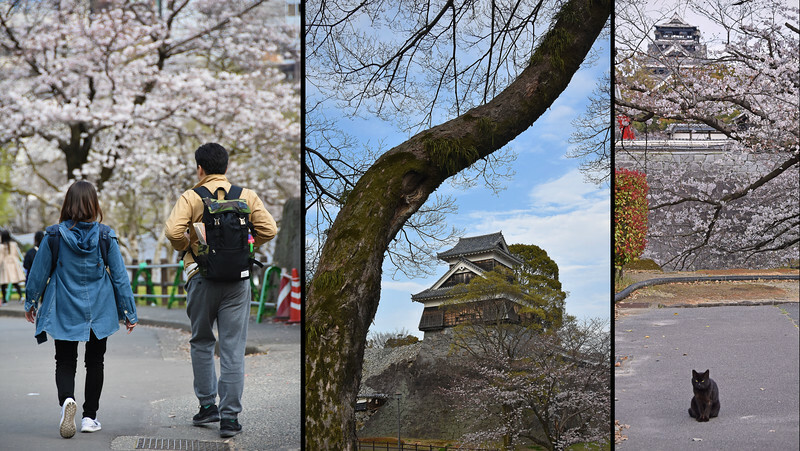 We enter the park where the castle is and are greeted by blooming cherry blossoms. Nice! We're a bit disappointed because we can't go into the castle. 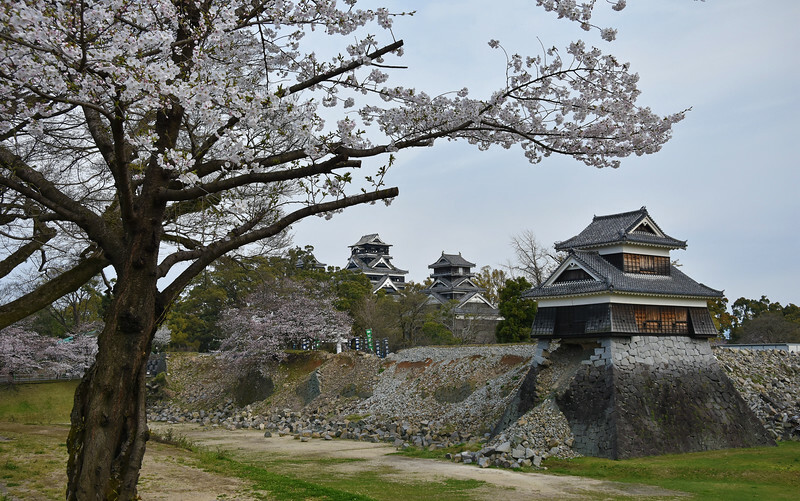 In April 2016, a 7.0M earthquake hit Kumamoto and the castle as well as many other buildings in the area were destroyed. 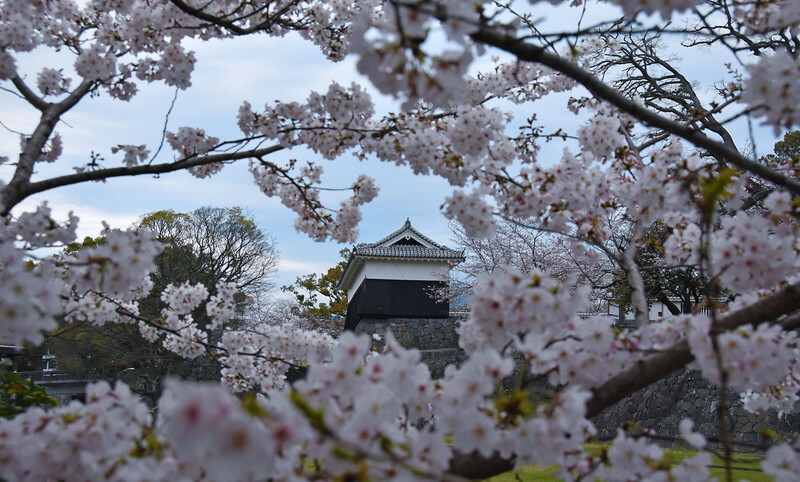 In the last year, reconstruction efforts have been underway to rebuild the castle. On the grounds, we saw bits of the castle on the grass, all labeled with numbers so they could repiece it together again. The Japanese are so efficient! 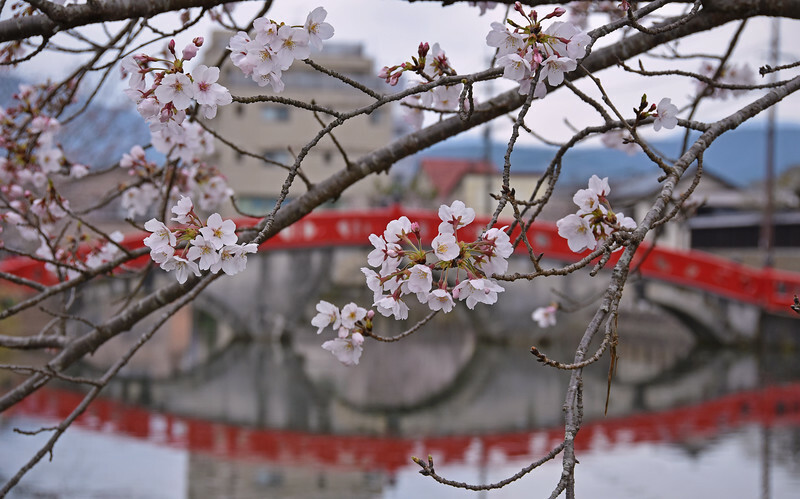 Hanami is defined as the "Japanese traditional custom of enjoying the transient beauty of cherry blossoms". 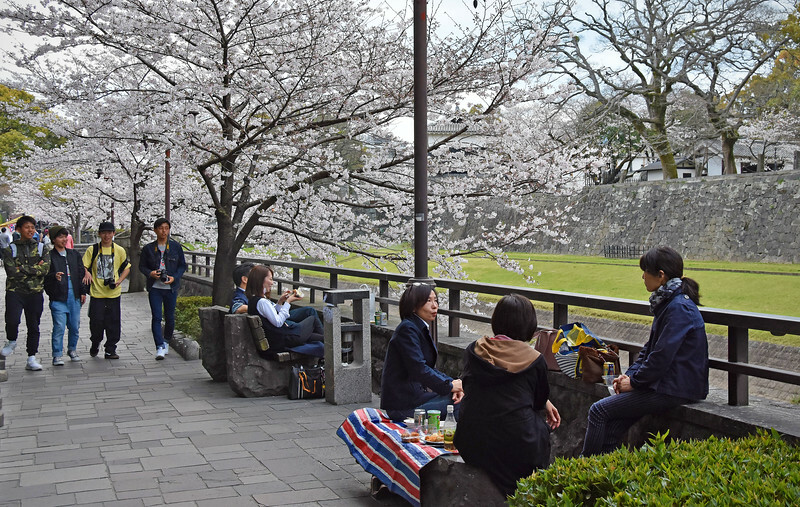 It is a national past-time during the early spring, where you grab a bento box, find a cherry blossom tree and sit underneath and enjoy your food and the view. If I could draw a parallel, it's as traditional as an American going to a baseball game and having hotdogs and beer. 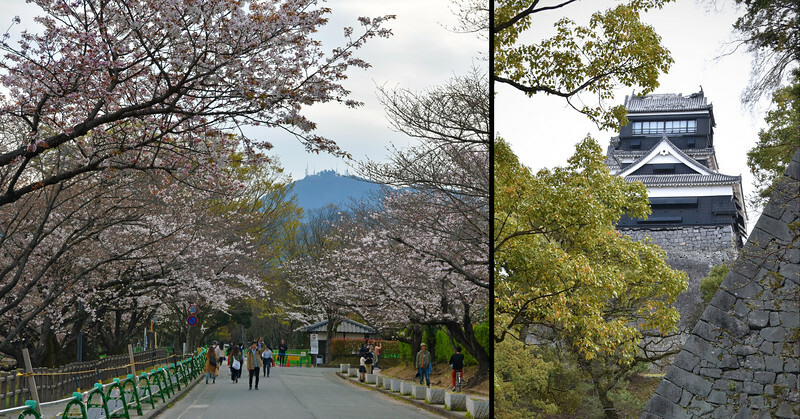 There's a funny saying around Hanami: "hana yori dango". 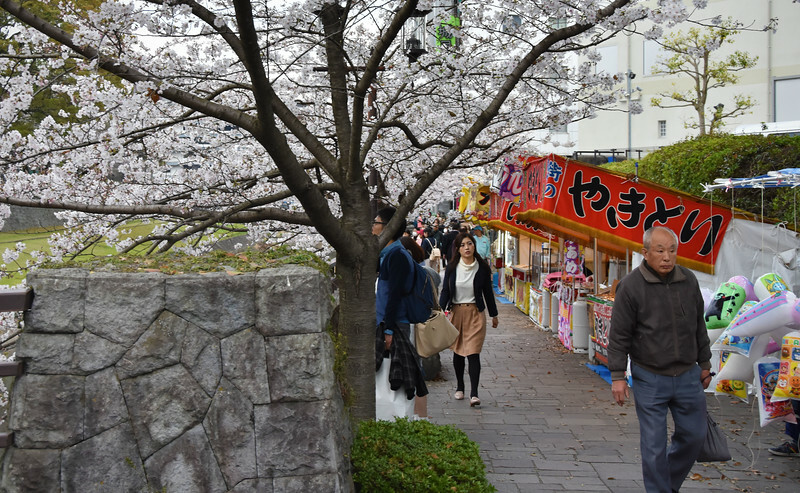 It means "dumplings rather than flowers" and pokes fun at people who enjoy the eating of the meal more than sitting and admiring the cherry blossoms. And the briefness of cherry-blossom season is about as short as the Maple Leafs playoff schedule. I don't know anything about baseball. Did I say that right? it's an activity that I can totally get on board with as well! 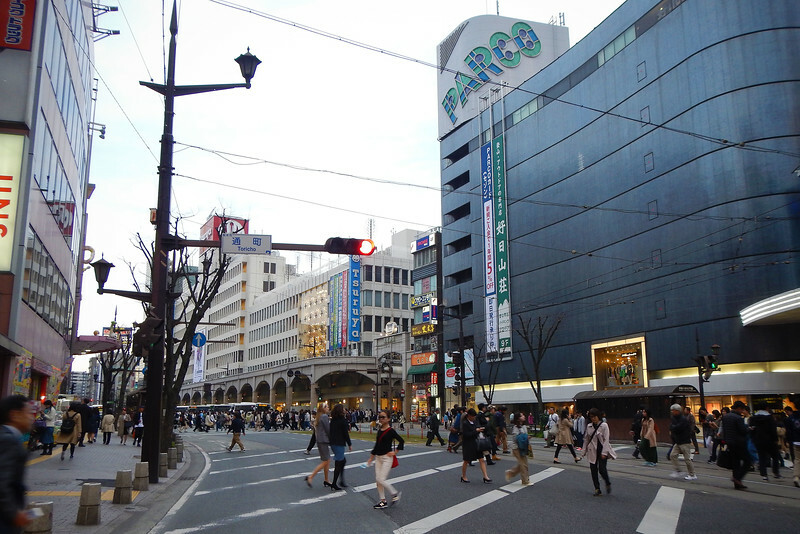 No matter, we head out of Kumamoto in the late afternoon to try to beat the big city rush hour. We're only a little bit successful. Although the GPS says it's only another hour or so to get to our next stop, we arrive in Aso just as the sun begins to set. We are starving and can't find a restaurant that's open. The lady that runs it is very nice, but she doesn't speak any English at all, which we're totally used to by now. I don't think we even ordered anything, we just sat down and did a bit of sign language to indicate we were hungry and then these plates appeared in front of us after a little while. It was very tasty: grilled beef with rice and miso soup. I love Japanese food! To our delight, it's a tatami room! 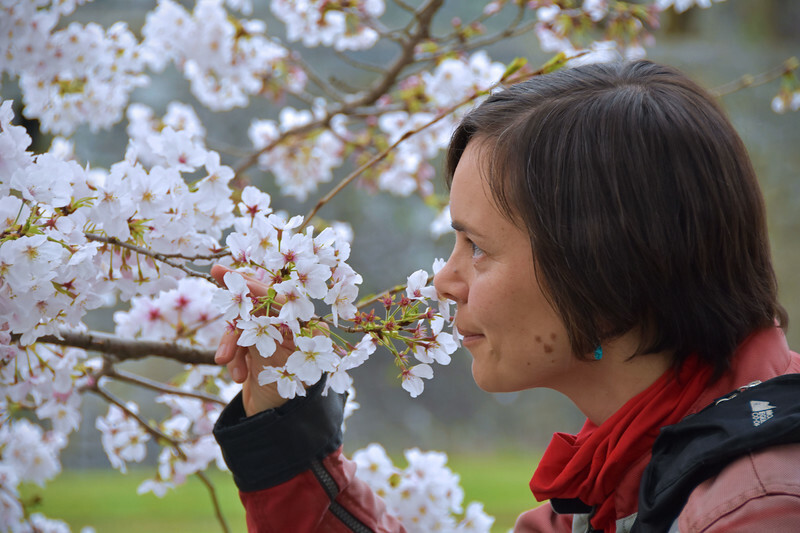 Finally after almost a month in Japan, we are able to see some cherry blossoms for Neda. 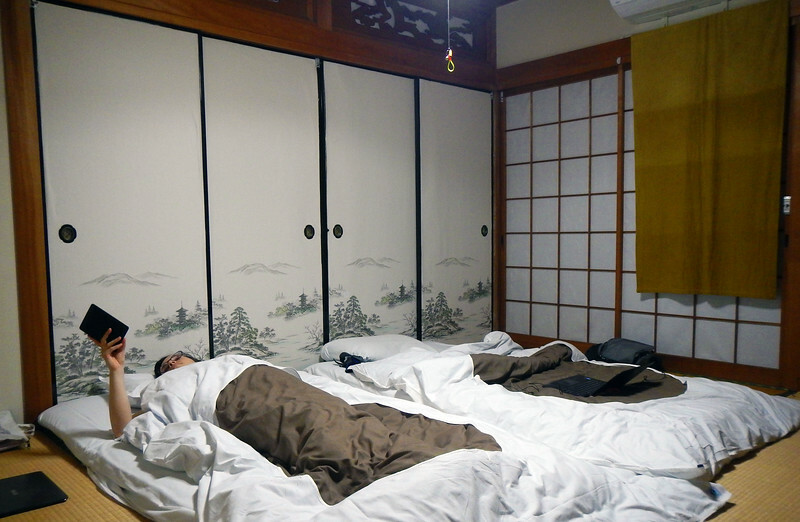 Had some great food today and we're sleeping in a cool tatami room tonight. What an experience! We are loving Japan!